Moxie Girl Recommends Going GreenHouse! With Moxie Girl’s increased focus on specializing in the care of vacation rental homes, we’d like to introduce you to our friends at Going GreenHouse! Going GreenHouse offers solutions for all your residential cleaning needs and more importantly, they share our love for natural cleaning products and satisfied clients! 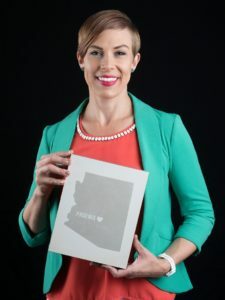 April, founder and CEO of Going GreenHouse grew up in Chandler, AZ, and holds a BS in Finance from ASU WP Carey School of Business – which, in her words, led to a “very boring” career in Pension Administration. These days April is busy running her own thriving business but still makes time to be heavily supportive of the Tammy D Foundation, participating in as many of their fundraising events as possible. For more info about the Tammy D Foundation. April is also proudly featured in the KNOW Phoenix book for 2018, which is “a community of women-owned businesses that you should KNOW and do business with, in Phoenix. These women are true rock stars of their professions, do tons of charity events and support other women without judgment,” says April. We say, nice! Moxie Girl recently had the opportunity to ask April a few questions about Going GreenHouse. Read on to find out why we recommend this fantastic local company! 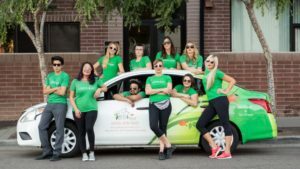 Moxie Girl: The Going GreenHouse website – which is awesome, by the way – states that you started your company because you realized the chemical cleaners you were using in your own home were making you sick. How quickly did your company plan come to action? Were you “solo” to start with? April: I was inspired by my corporate job to do something that allowed me to have a flexible schedule as well as an active lifestyle. I started cleaning the homes of friends and family on the weekends. After about 9 months of doing that, I had enough business to quit my full-time job. I was solo for the first couple of months, but I realized that in order to get more done I would have to hire someone to help me on an as-needed basis. I was referred to a family friend, Lisa. I asked if she wanted to help me out and she said sure. Lisa is about to celebrate her 7 year anniversary with us! She is now my full-time office manager and the “yin to my yang” when it comes to running the business and that’s a nice balance to have. MG: Just based on his photo, I totally want to hang out with Crew Leader, Damani, for happy hour. How many employees does GGH currently have, and what’s most important to you when you are adding to your team? Any plans for growth? April: Haha – we caught Damani in a rare moment with that pic! He is usually pretty quiet and reserved, if you can believe that. Damani is more of an animal guy than a party animal. In fact, more than a handful of clients have written us thank you cards and given us 5 star reviews – from their pets – because he is so good and loving towards all animals! 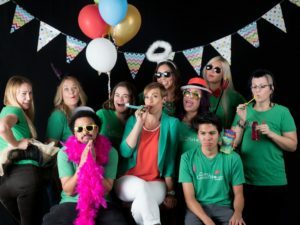 We have 15 on our team currently and Going GreenHouse is always looking to add awesome people. The more team members, the more business we can schedule, after all! When hiring, the main things I look for are punctuality, reliability, teamwork, and positive attitude. A positive attitude, especially, will get you a long way in my book! This means if you accidentally damage something at a client’s home or if you get negative feedback, you take responsibility, own it and find a way to correct it without getting upset or taking it personally. MG: GGH seems to have a special relationship with your clients, as well as with their pets. Do you find that clients are more willing to trust (and are less likely to feel “judged” by) a cleaner when they know that person is also an animal-lover and/or a pet owner? April: I do think that most people are concerned about how their pets feel about the new people in their homes because pets are part of the family too! We have cat and dog treats at the ready just in case we need to make friends fast! It is important to us that everyone in the family is comfortable with our being there. As far as being judged, I think that people naturally feel like they are being judged especially if they haven’t been able to maintain their home for one reason or another. I have had clients that apologize the whole time I am performing a consultation and I tell them a few things…1. We are no-judgment cleaners 2. They’ve got better things to do than cleaning their homes, like spending precious time with family or working on their own businesses. 3. A needy home is job security for us, so we can’t be mad at that! We love to see a fabulous turnaround on a house when we finish! MG: Are there any particular or unusual challenges your clients present that you feel GGH excels in dealing with? April: I always tell my referral partners to send me their pickiest clients. We use a very detailed checklist to manage client expectations, plus we have an electronic file for each client for any special requests or pet peeves. I do an on-site consultation prior to every single first service to make sure we capture every client’s specific needs. We value communication and send a feedback e-mail after every service to keep our communication fresh. We have a 100% satisfaction guarantee so if any client is unhappy, we will send a crew back ASAP to remedy whatever was missed. Also, each month our team members earn gift card incentives based on the positive client feedback they receive. The people I hire are natural people-pleasers and genuinely care if the client is happy. MG: What’s the best compliment you’ve ever received from a client? April: We are affiliated with the Tammy D Foundation, which pays us a discounted rate for us to clean homes of women battling breast cancer. We usually have 5-10 of these clients on our schedule each month. Going GreenHouse sends a crew of 2 people to their home for 2 hours to do whatever household chores they need to be done. These women are by far our most grateful clients and when they send me a testimonial they usually make me cry because I am so moved by the generosity and care of my employees. Our crews take a special interest in making sure these ladies are comfortable. They go above and beyond and even become close, personal friends with some. It’s a really special bond and I’m proud to be able to facilitate it and proud of my crews for having such huge hearts that they use their own money to bring treats and gifts to our Tammy D clients and otherwise go out of their way when they can do something special for these ladies. MG: I know using natural/chemical-free cleaning products is very important to you. How did you – and do you – decide on specific products for use at Going GreenHouse? April: We are always trying new products! If we don’t love the way something works, we will continue researching by following blogs, asking clients and doing web research. We also do a lot of ‘trial and error’ in our own homes to find out what works best! We had a hard time finding a great “green” stainless steel cleaner for many years and had resorted to using olive oil. Olive oil does work, but it can be messy which of course is not ideal. We finally found one that we love from “Earth-Friendly Products” that we found on Vita-cost.com. The Going GreenHouse slogan is “Building a relationship with your family, your pets and your home” – and they mean it! From one-time services to regularly scheduled cleanings, Going GreenHouse is the eco-friendly, all natural answer to your residential cleaning needs. Get a free quote – visit or call 602-476-9321 today!